12/16/2018 – Record Release Party at Experimental Intermedia Foundation. Celebrating the release of Cecilia Lopez: Machinic Fantasies/Red on XI Records plus releases by Leslie Ross and Phill Niblock. Experimental Intermedia Foundation, 224 Centre Street 3rd Floor, NYC. 9pm. 11/23/2018 – Opening and performance of RED as part as the XIV International Cuenca Biennial. Museo de las Conceptas, Hermano Miguel 6-33, Cuenca Ecuador. Performance 5pm. 11/13/2018 – RED (solo performance) at Holo. Sharing the bill with Brandon Lopez, Matteo Liberatore/Tony Malaby, Joanna Mattrey. 1090 Wyckoff Avenue, Brooklyn. 8pm. 11/07/2018 – Cecilia Lopez/Sandy Ewen, CP unit and Judith Berkson & Franke Vogl. Record Shop 360 Van Brunt St, Brooklyn, NY. Doors at 8pm. 10/25/2018 – Antucasual Systems and Quibt present: Henry Fraser, Cecilia Lopez, Ben Bennett/Michael Foster and Sandy Ewen. Qubit, 1850 Amsterdam Ave, New York. 8.30pm. 09/21/2018 – Fridman Galley 5th Anniversary Festival. Cecilia Lopez/John Driscoll and Lea Bertucci/Seth Cluett/Phil Edelstein. Fridman Gallery, 287 Street, NYC. 8pm. 09/15/2018 – Cecilia Lopez/Sandy Ewen. Flowers for all Occasions. 1114 DeKalb Ave, Brooklyn. 12-3pm. 09/10/2018 – Neither/Nor Records Presents at W/o/N. Ben Gerstein/Flin van Hemmen/Sean Ali, Joanna Mattrey/Cecilia Lopez/Simon Hanes, Jason Nazary/Carlo Costa. Wonders of Nature. 131 grand Street, Brooklyn. 8pm. 09/07/2018 – New Sound Works & Experiments (Night 2). Cecilia Lopez, Jenn Grossman, Freddie Wyss (Warm Canopy). Signs and Symbols, 102 Forsyth Street, Nueva York. 7pm. 09/04/2018 – Cecilia López/Joanna Mattrey, Carlor Quebrada/Brandon Seabrook, Bloor, Aylu/DJDam folk. The Glove, Brooklyn. 9.30pm. 08/30/2018 – Maria Chavez, Dogo Mandarin (Cecilia Lopez/simon Hanes), Juan Valente, Visio. The Glove, Brooklyn. 9.30pm. 08/25/2018 – Ken Jacobs’ Nervous Magic Lantern and Contour Editions: Imaginary 3D Tour of Rubble Cities. Live mages by Ken Jacobs. Sound by Andy Graydon, Cecilia Lopez, Daniel Neumann, Jenn Grossman, Michael Schumacher, Richard Garet. Museum of the Moving Image – Redstone Theater, 36-01 35th Ave, Astoria, NY. 2pm. 08/22/2018 – WORK #43 – Cecilia Lopez/ Andrew Neumann/Mike Sidnam/Crystal Penalosa/Dylan A. Marcheschi. Muchmore’s, 2 Havemeyer Steet, Brooklyn, NY. 20:30pm. 06/08/2018 – Cecilia Lopez/Wenchi Lazo, Javier Areal Velez/Yoto Sanodval/Carlos Eduardo Quebrada Vásquez. La Gran Jaime, Aráoz 832, Buenos Aires. 21hs. 05/30/2018 – Dogo Mandarin (Cecilia Lopez/Simon Hanes), Vic Bang Barca Vikinga, Barbi SA. El Club de los Miercoles. Balvanera, Buenos Aires. 21:30hs. 05/26/2018 – Cecilia Quinteros/Cecilia Lopez/Barbara Togander, Javier Areal Velez/Simon Hanes/Andrés Elstein. Vicente El Absurdo, Julián Álvarez 1886, Buenos Aires. 21hs. Entrada $100. Jorge Espinal/Simon Hanes/Marcelo Von Schultz. Una Casa, San Telmo, Buenos Aires 22hs. 05/07/2018 – Cecilia Lopez – Machinic Fantasies (Roulette Commission). With Jean Carla Rodea, Julia Santoli, Christopher McIntyre and Joe Moffett. Roulette, 509 Atlantic Avenue, Brooklyn, New York. May 5th at 8pm. 03/29/2018 – Synth Nights at The Kitchen. Composers Inside Electronics. Works by Paul DeMarinis, John Driscoll, Phil Edelstein, Tom Hamilton, Ralph Jones, Michael Johnsen, Ron Kuivila, Cecilia López, Paula Matthusen and Margaret Anne Schedel. The Kitchen 512 W 19th St, New York. March 29–31, 8pm. Tickets $20. 03/06/2018 – Cecilia Lopez/Matt Mottel. TROOST, 1011 Manhattan Ave, Brooklyn, New York. Music at 8:30pm. 02/24/2018 – Martin Escalante/Matt Mottel, Cecilia Lopez/Sandy Ewen + Drooids. Record Shop 360 Van Brunt St, Brooklyn, NY. Doors at 8pm. 02/10/2018 – Improv sets by Eugene Chadbourne, Shelley Hirsch, David Watson, Sandy Ewen, Cecilia Lopez + Talibam! 131 Grand Street, Williamsburg, Brooklyn, NY. 9pm. 11/26/2017 – RED – Performance as part of Festival Punto de Encuentro organized by the AMEE (Asociación de Música Electroacústica de España) at MEM Bilbao Exhibition Hall. Harrobi Square no. 4, Vizcaya, Bilbao, Spain. 11/18/2017 – RED – Performance as part of Festival Punto de Encuentro organized by the AMEE (Asociación de Música Electroacústica de España) together with works by Lucio Capece and Gabriel Brncic at SGAE Cultural Center auditorium, Valencia, Spain. 10/01/2017 – RED – Installation/Performance as part of Harvestworks EARS Residency. Harvestworks 596 Broadway Suite 602 New York. 7pm. 09/22/2017 – Earshot Opening Reception (Group exhibition). Earshot will be on view September 22nd – October 15th, Wednesday through Sunday, 1-6pm or by appointment. 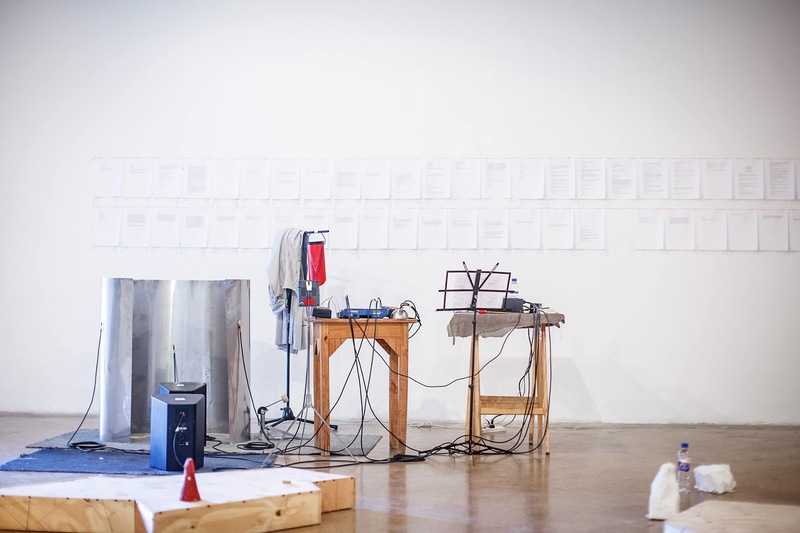 A group performance of the works will take place on Saturday, October 14th, 7 – 9pm. Outpost Artists Resources Inc, 1665 Norman St, Nueva York. 08/24/2017 – La Corporación (Cecilia Lopez, Cecilia Quinteros, Amanda Irarrazabal), at CuatroTRes, Villa Crespo, Buenos Aires, 21hs. 08/04/2017 – RED (performance) at Not a Rehearsal; In Flux of Upturned Pleasure. El Museo de Los Sures, 120 S 1st Street, Brooklyn. Opening Reception and Performances: Friday August 4 from 6 to 10pm. 08/02/2017 – Territorial Limits. – Aaron Moore / Cecilia Lopez / Alan Courtis & Cyrus Pireh (Coils on Malbec) / Burned House Horizon (Sarth Calhoun, Michael Clemow, Jacob McCoy). Secret Project Robot, 1186 Broadway, Brooklyn 11221. $10. Doors 8pm, concert 9pm. 07/16/2017 – Just Situations: Day 4, (Meta)physical Manifestation. Jules Rochielle, Siri Nelson, Raha Behnam, Cecilia Lopez, Cherrie Yu, Miao Jiaxin, Sophia Mak. Grace Exhibition Space, Broadway 840, Brooklyn. Performances 4pm-11pm. 06/23/2017 – Ron Shalom / Cecilia Lopez / Anna RG. Monday July 3rd @ 20hs. Threes Brewing, 333 Douglass Street, Brooklyn NY. 06/09/2017 – New York Electronic Art Festival. Artists talk: Works by Cecilia Lopez. Meet The Artist Event with Andrew Demirjian and Katherine Liberovskaya: Friday June 9th @ 7pm Harvestworks, 596 Broadway 6th floor, NYC. 05/25/2017 – CT:SWaM:  A Spatial Sound Session for the 5th Anniversary. For its 5th anniversary celebration CT::SWaM is proud to be presenting collaborations and compositions. Works by: Claude Edwards, Merche Blasco, Shelley Hirsch, David Linton, Cecilia Lopez, Matthew Ostrowski and Kamron Saniee. Knockdown Center, 52-19 Flushing Avenue, Queens, NY. 19hs. 04/09/2017 – RED at Clocktower Radio. She Resonates invite sound artist Cecilia López to join us for an in-studio performance 5-6PM this Sunday, April 9th in conjunction with Pioneer Works’ Second Sundays programming. 159 Pioneer Street, Brooklyn, New York. 02/22/2017 – Eardrumcluster installation as part as Mixology Festival 2017, curated by Michael J. Schumacher. Together with works by Olivia Block, Jason Lescalleet, Jim O’Rourke and Mario de Vega. Roulette, 509 Atlantic Avenue, Brooklyn, New York. Wednesday February 22 at 7:30pm. 02/16/2017 – 02/16/2017 – Mario de Vega / Cecilia Lopez at Issue Project Room, 22 Boerum Place, Brooklyn, NY. 8pm. 02/04/2017 – La Corporación (Cecilia Lopez, Cecilia Quinteros and Amanda Irarrazabal) + Christof Kurzmann. Also Luis Conde with Christoph Gallio and the trio of Alma Laprida, Eva Garcia Fernandez and Lucía Drocchi. En una.casa. Buenos Aires, Saturday February 4th at 22pm. 02/03/2017 – (In)visible dreams and streams. Nordic-Baltic Contemporary Art Exhibition. ARS Project room, Pärnu mnt 154, Tallinn, Estonia. The exhibition will be up from February 3rd until March 3rd. 12/02/2016 – 01/15/2017. (In)visible dreams and streams. Nordic-Baltic Contemporary Art Exhibition. Contemporary Art Center in Vilnius, Lithuania. Opening: Friday December 2nd at 6 pm. 09/15/2016 – 10/04/2016. (In)visible dreams and streams. Nordic-Baltic Contemporary Art Exhibition. Bergs Bazaar, Elizabetes iela 83, Centra rajons, Rīga, Latvia. 10/26/2016- Ivan Khilik, Aaron Moore, Cecilia Lopez. WORK at The Sump, 1563 Decatur St, Nueva York 11385. 8.30pm. 08/07/2016- Cecilia Lopez / Lucio Capece / Eliad Wagner. Studio Acht – Grüntaler 8, Berlin-Wedding. Bar opens at 19.30. events begin promplty at 20:00pm- more info. 07/22/2016- Avido. Cecilia Quinteros + Cecilia Lopez + Amanda Irarzabal / Jorge Espinal + Juan Martin Jimena. CuatroTres. Ciudad de Buenos Aires. 22hs. 04/05/2016 – Cecilia Lopez´s Graduate Thesis Concert – Wesleyan University, World Music Hall, Middletown CT. 9pm. 04/16/2016 – Los Pescadores de Perlas, ciclo de conciertos y conversaciones públicas entre Artistas Sonoros y Multimediales. UNA Universidad de las Artes. Miércoles 16 de Marzo de 19:00hs. Aula 109 (Aula Magna) Sede Artes Multimediales. Av. Don Pedro de Mendoza 679. Buenos Aires. Entrada libre y gratuita. 02/27/2016 – Ammerman Center for the Arts and Technology Symposium. Experimental music show. Spark Maker Scape, 86 Golden St. New London CT, 8PM. 11/27/2015 – RED at Kunternes Hus, Oslo Norway. Wergelandsveien 17 – 9 pm. Also Lars Laumann´s premiere of “Seasons of Migration to the North” with original music by Cecilia Lopez. Show on view Nov 27th – Feb 17th. 10/20/2015 – Wesleyan´s Graduate Concert Series- Pieces by Gustavo Ribicic and screening of video pieces by Cecilia Lopez. CFA Hall, Wesleyan University, Middletown CT. 9PM. 04/30/2015 – Experimental Music for Vocal Ensemble. NYC Virtuoso performing “Versiones Arruinadas: 5 minutos de Burroughs” directed by Harold Rosebaum. Crovell concert Hall, Wesleyan University 8pm. 03/04/2015 – Vigilante Margarita / Bernd Klug / James Strong at Wesleyan University. Memorial Chapel, 221 Church Street, Middletown, CT 06459. Free admission. 02/28/2015 – Vigilante Margarita at MAC Gallery. 650 Main Street, Middletown, CT 06457.